All Unitronics PLC's have excellent communication abilities with a variety of physical ports and software protocols available to interface different control equipment from many manufacturers. The V130, V350, V430 and V700 series integrated PLC/HMI are unique in that a Profibus board can be fitted to allow the units to act as a Profibus slave. Function blocks in the Visilogic programming software make implementation genuinely simple and quick leaving more time for writing machine control. A simple one line , one element program configures the V350 or V130 as a Profibus slave with the ability to let the master read and write 96 registers and 1024 bits. Combine this Profibus port with another protocol, such as Modbus running on a serial port, and you have a Gateway from one network to another. A V130, V350, V430 and V700 combined PLC/HMI acting as a Profibus slave has two additional ports fitted, one RS232/RS485 and one CANbus capable of running the following protocols. 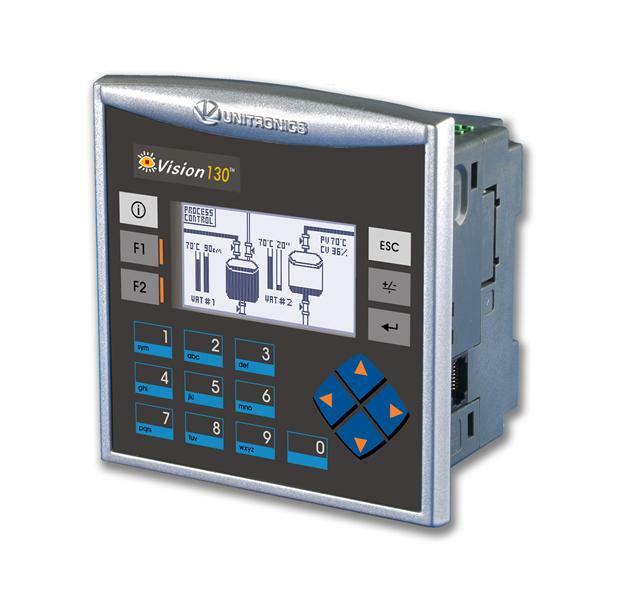 The V130, V350, V430 and V700 PLCs can be used as a standalone Profibus Gateway or they can also have their own IO and act as a PLC and HMI as well.